35 registered members (billt460, ctechbob, dlundblad, CB900F2, aba4430, 5 invisible), 675 guests, and 19 spiders. Hypothetical scenario. I have no real world testing on this. Let's say Engine A has a typical operating oil temperature of 210-225*F. Let's say this engine has evaporative oil consumption (through the PCV system) at the rate of 1 quart per 5,000 miles. We add an oil cooler and thermostat that now keeps the typical operating oil temperature at 175-190*F.
Would it be a reasonable assumption to say the evaporative oil consumption (volatility) would decrease with the decrease in oil temperature? If not, why? Logically it makes sense that higher temps would cause more evaporation. Don't forget that oil in the ring belt is at a slightly different temperature. What's your hypothetical oil cooler going to do there? That makes sense, though I wouldn't want an oil cooler for a DI engine. Need that heat to boil off the gas. This PhD thesis by Ertan Yılmaz of MIT is probably the best study on oil consumption ever, showing the contributions of evaporation (at the cylinder liners), blowby (through the PCV valve), and oil transport (past engine valves and cylinder rings) against various variables. "Oil evaporation is mainly governed by engine liner temperature, mass transport in the gas phase, and the available time for evaporation. Increases in engine speed increase evaporation due to the enhancement of the mass transport in the gas phase and due to the increased liner temperatures. The available time for evaporation decreases per cycle as engine speed increases, which competes with the two above effects. 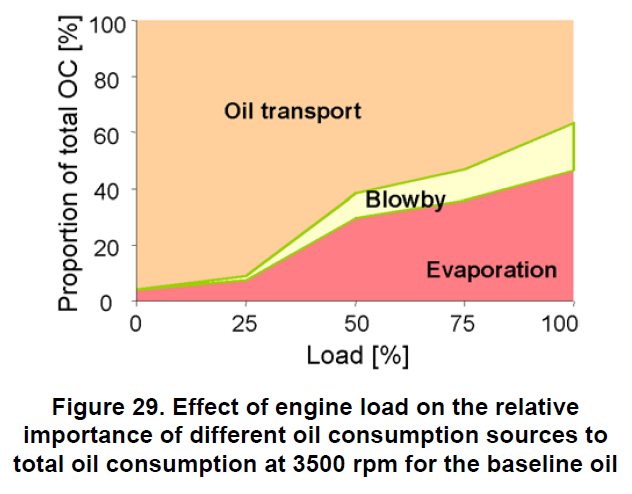 Since the contribution of oil evaporation increases with engine speed, the effect of higher liner temperatures and increasing mass convection coefficients must have a higher impact than the lower time available for evaporation." Can you define oil transport for me? What is that referring to? EDIT: Nevermind. Reading through the articles, it seems transport is referring to oil getting past the rings and pistons and being consumed in the chambers. Last edited by RDY4WAR; 03/13/19 09:18 PM. If I'm understanding those tests correctly, oil transport and cylinder wall temperature has a greater impact on oil consumption than oil pan temperature. Given this information, what are ways to reduce transport past the rings? Would higher viscosity reduce transport? Higher or lower HTHS? That's correct regarding the temperatures but the coolant temperature is shown to directly relate to the liner temperature and load according to Figure 4-15 at Page 114 in the thesis. 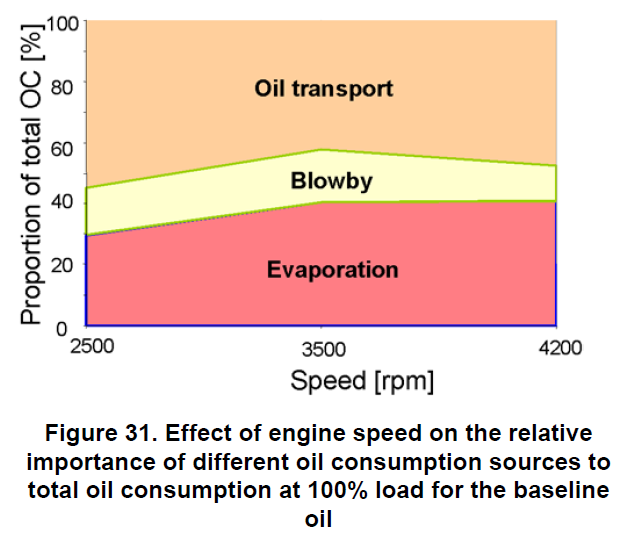 The effect of the viscosity on the oil consumption by the piston rings is modeled in Section 3.3.2.2 (Page 62) and the increasing dynamic oil viscosity (HTHSV) seems to reduce the amount of oil being dragged by the blowby by the cylinder rings. However, the oil film-thickness is also there and makes it complicated. According to Fig 4-17 on Page 116, the oil consumption is increasing with the liner temperature at small load, where the evaporation and PCV consumption should be minimal. So, it looks like the decreasing HTHSV is increasing the oil consumption by the rings. So in any form, it seems an oil with high HTHS and low volatility is key to reduced consumption. Could this explain situations where consumption increases the longer the oil is used if the HTHS goes down from shear? isn't the oil temperature MUCH higher where the moving parts and especially the cylinders are and that's where the bulk of evaporation takes place? I'm guessing keeping the pan temperature 30° lower won't make a significant diff in evaporation loss. I would try a lower Noack oil before adding an engine oil cooler just for that (consumption) purpose. I think many people overfill the oil sump, which gives the false impression that initially the oil consumption is a lot lower, as it takes a while for the oil level to fall to the full mark, especially if the sump widens above the full mark. When the oil ages, HTHSV could drop due to permanent shear or increase due to base-oil oxidation -- it's hard to say. I've seen cases where oil consumption increased after switching from a GTL synthetic (PP) to a PAO/POE synthetic (RL) despite having a lower volatility and higher HTHS. It went from 1 quart every 7,500 miles to 1 quart every 6,000 miles. In such a case, where would you start looking to find the issue? I could well be wrong, but I think there is an oil consumption tradeoff between engine wear vs. emissions where lower consumption would equate to lower emissions and higher consumption would equate to lower wear. That explains the correlation between ester content and oil consumption. In my experience, an oil with ester will have higher consumption than an oil without ester, even with the same volatility. Has anyone else noticed this? The theory being that esters are more polar and cling to cylinder walls causing more consumption... but also providing a better film for the rings to ride on. Last edited by RDY4WAR; 03/14/19 01:30 PM. There are so many variables involved and it can't be generalized. One oil change in one car, different seasons and different driving conditions ... you can't draw any conclusion. I've experienced same thing (more consumption) between comparable oils (noack) after switching brands but by the next oil change, the consumption was back to normal. did the engine get used to the new oil or was it due to the other variables i mentioned above? I couldn't draw any conclusion. Maybe the way different oil interact with seals or the way they form tribofilm, etc. can contribute to consumption ... You always here this car likes this or that oil but you can't judge by just one oil change.